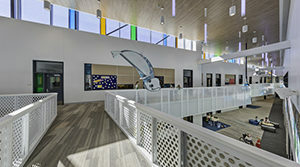 Daylighting was a key driver of the design for the new Dena’ina Elementary School in Wasilla, Alaska. WASILLA, Alaska — During the winter, Wasilla, receives an average of six hours of sunlight per day — meaning students have a limited amount of time to reap the benefits of natural daylight. As such, maximizing daylight quickly became a key design driver for the new Dena’ina Elementary School in Wasilla. 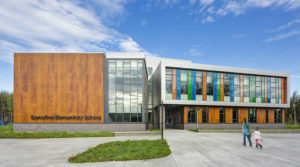 The main goal of the PreK through fifth-grade elementary school was to add capacity, and Dena’ina Elementary School is one of six new schools built for the growing Matanuska-Susitna Borough School District (MSBSD) in recent years. The 400-student school was built using a portion of a $214 million school construction bond approved by voters in 2011. The $18.4 million project broke ground in May 2015, and construction was completed in July 2016. The Chicago office of Perkins+Will served as the design architect, while Anchorage, Alaska-based Bettisworth North Architects and Planners served as the architect of record and landscape architect, and Palmer, Alaska-based F-E Contracting Inc. served as the general contractor. Built on the same campus as the Joe Redington Sr. Junior/Senior High School that opened in 2015, Dena’ina is situated in a forest of birch trees. 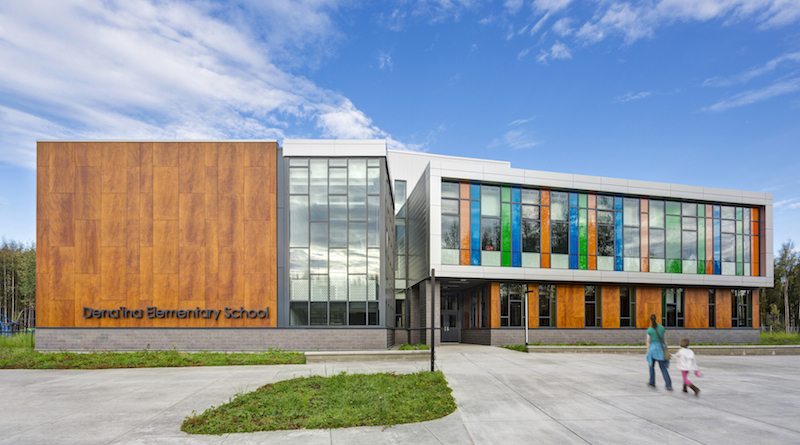 Its design is rooted in its sense of place, with a strong connection to the outdoors and has quickly become a prototype for how schools can maximize daylight in Alaska. The Perkins+Will design team started with the idea of adaptability and addressed ways to rethink the traditional idea of classroom spaces. The team, together with school faculty members, spent a productive four days as part of a design workshop that led to the development of the school’s basic concept of organization. Snapp said that the team decided upon a compact form to maximize daylight in the academic spaces. The design positioned the 44,000-square-foot school so all classrooms face south and feature vertical windows that stretch along the exterior. The gymnasium, kitchen and administration spaces were then built to the north. Color also plays a key role in how light fills the space. The vertical windows on the exterior vary in hue from clear to tinted blue, orange and green, while colored skylights and LEDs inside can create a vibrant space even when light is not available naturally. The composite wood ceiling and white walls in the commons area serve as a canvas showing off the bright colors as the light moves across the horizon. Perforated railings that extend along the second floor and down the staircase continue that flow of light. “The combination of color and perforated panels that line their way through the space as a ribbon creates a lot of playfulness throughout the day,” said Julie Michiels, senior project designer for Perkins + Will. 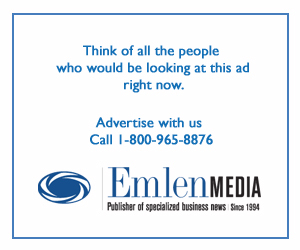 Read the rest of the article in the May issue of School Construction News, which can also be found online here.